Robert Dorrington of Weston looked out the window at Arlington National Cemetery on Sunday. WASHINGTON — As Robert Johnston, 90, stood at the World War II Memorial 67 years after serving in the Marines, he thought of his best friend who was killed at the Battle of Saipan. Johnston, a second lieutenant who earned a Bronze Star and two Purple Hearts at Saipan and Iwo Jima, said being able to visit the memorial for the first time gave him a chance to reflect. “It’s so good to be here and to think back about the people that didn’t make it, unfortunately,” said the Stoneham resident. On Sunday, nonprofit Honor Flight New England took 61 local World War II veterans to Washington, D.C., to visit the memorials that honor them for their sacrifices. In anticipation of Memorial Day next week, the veterans, now in their 80s and 90s, reflected at the National World War II Memorial, the Korean War Veterans Memorial, the Lincoln Memorial, the Vietnam Veterans Memorial, the Marine Corps War Memorial, and the Air Force Memorial. “It’s been 70 years for some of us, and it brought back some memories,” said Johnston. Honor Flight New England, a regional branch of the national Honor Flight Network, covers the transportation and food costs for day trips for the veterans. 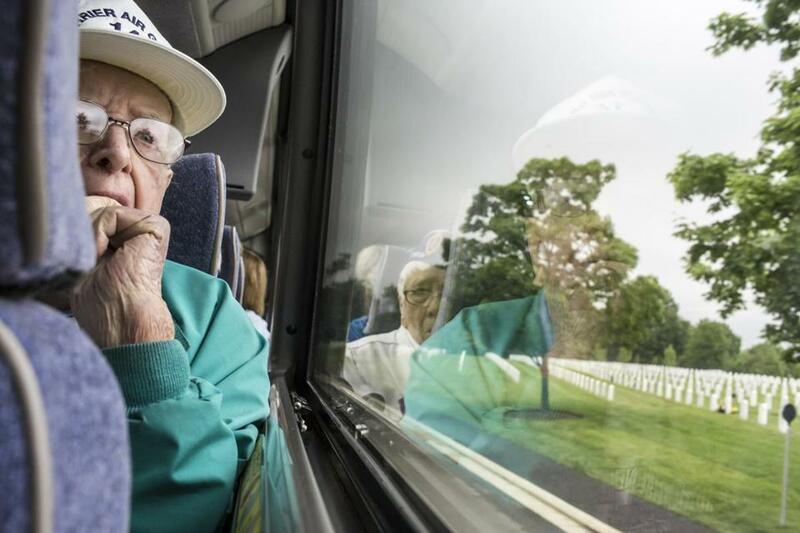 Morris Morris, 88, of Revere, who made wisecracks during much of the trip, turned serious when he said he couldn’t get enough of the memorials and the camaraderie among the veterans. According to the National Center for Veterans Analysis and Statistics, the United States loses 642 World War II veterans every day. Massachusetts has 36,835 living veterans from the war, and Honor Flight New England is determined to thank them all for their service while there’s still time. With about five flights a year since 2009 funded by donations and sponsors, more than 800 local veterans have made the trip. About 100,000 veterans have participated nationwide. Joe Byron, the founder of the New England branch, said the satisfaction he gets from facilitating the trips is incomparable. “They don’t expect that they would ever be able to come on a trip like this so it’s an honor,” he said. Former senator Bob Dole, 89, who was wounded in the war, made an appearance with his wife, Elizabeth, at the World War II Memorial to meet the Honor Flight participants. The popularity of the regional program, which made its 27th flight on Sunday, means an ever-growing waiting list of more than 100 veterans. Byron said that while the group is starting to accept applications from veterans of the Korean and Vietnam wars, priority is given to those who served in World War II and terminally ill veterans from any war. Dorothea Otis, 92, of Millis, a World War II nurse with a Purple Heart, made her first trip to the war’s memorial on Sunday with her husband, Raymond Otis, also a veteran. Byron said that the veterans sometimes don’t feel that they are worthy of the Honor Flight treatment. Morris said that making the trip with his fellow veterans gave him a feeling of unity he hadn’t felt in a long time. Christina Jedra can be reached at christina.jedra@globe.com. Follow her on Twitter@Chris­­tinaJedra.